Pro-Flo Products Inc., of Cedar Grove, N.J., introduces a colorful product brochure for a line of reverse osmosis systems. This brochure details the step-by-step reduction of the various undesirable contents of drinking quality water. 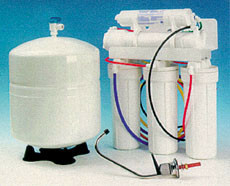 Pro-Flo uses one-micron filtration where most systems try to get by with five-micron filtration. Pro-Flo also uses carbon block filters for longer chlorine life, where many others would use granular carbon.